After twenty years in the making, three life-long friends, Eduardo Maytorena, Wayne Mitchell, and Jesse Celedon set out to film what they hope will be an unforgettable movie titled Soledad to be showcased at this year’s Chicago Latino Film Festival. 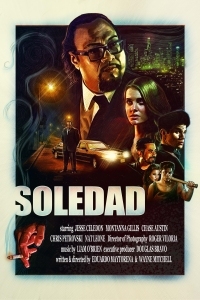 Based in the city of Angels, Soledad is a movie about an introverted limousine driver named Victor, played by Jesse Celedon, finds himself in an unlikely circumstance when he is forced to save a client, Raquel, from being sexually assaulted by her prom date. What Victor believes to be an act of kindness quickly ignites a chain of events that brings him to confront his past. For the rest of the night, Victor has to maintain whatever peace he has worked hard to secure. We spoke to director Eduardo Maytorena about his film Soledad and what the audience can expect to see. Lawndale Bilingual Newspaper: Tell me what it was like to work with two of your friends to create and produce Soledad? What were some of the challenges, if any you faced working together to bring Soledad to life? Eduardo Maytorena: The experience was surreal. After 20 years of talking about making movies, here we were making one. Each one of us brought a unique strength to the project and I feel that there was a great balance between us three. I enjoyed focusing on the performances as Wayne [Mitchell] worked the technical and at other times those roles were reversed. Jesse [Celedon] being a lot like his character Victor is a great listener and always reliable in giving perspective from 50,000ft above. My biggest challenge was my full time job that I worked during the production of the film. At one point I had been up for 72 hours with only a few hours sleep. Lucky for me I had both Wayne and Jesse to rely on to keep me going. What inspired the story of Soledad? Soledad was inspired by a mutual love of our lead actor Jesse Celedon whom I met back in high school 20 years ago. Jesse was my first student I coached in Speech and Debate back in 1996. He went on to win the National Dramatic title in high school. We moved to Los Angeles together to pursue or dreams of acting and making films but discovered the harsh reality of Hollywood quickly. After a few years life led us both from Los Angeles, myself traveling around the country and Jesse, Bakersfield CA where he currently operates a boys home rehabilitating disadvantaged kids abandoned by their parents and supported by the state. On a camping trip a few years ago a spark of inspiration was lit in a conversation with Jesse about taking destiny into hands if you want to accomplish anything in this life. Soledad essentially was the answer to how we could demonstrate Jesse’s raw acting talent beyond the thug, bouncer, “tough guy” roles that he would have to audition for if he were to come to Los Angeles to pursue his lifelong dream. The challenge would be to find the right story that could show the “teddy bear inside the tough guy.” With that goal in mind, Soledad was born. What do you hope the audience takes away from viewing Soledad? I hope that the audience enjoys this simple slice of life we set out to tell. That even without special affects, or expensive budgets they feel by the end that they’ve been on a journey. Perhaps even empathize more with people of the service industry whom they may overlook and wonder have many silent heroes they cross paths with everyday. To purchase tickets, visit chicagolatinofilmfestival.org.